Many out of town executives will find that maneuvering through Tampa can be a rather confusing and stressful thing to do. The roads can make people feel like they are rats trying to make their ways through an intricate and complex maze. It’s very easy to get lost only to realize that they’ve been going around in circles trying to get to where they’re going. This can not only make the attendees late for events, but can also cause them so much stress that they will not be as productive as they normally would be. Professional minibus services can eliminate the potential problems facing out of town attendees getting to the events. Luxury Transportation Group USA provides reliable corporate mini coach transportation in Tampa and the surrounding cities. 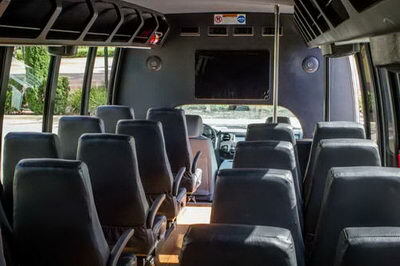 The use of mini coach transportation is truly beneficial for companies having corporate events in Tampa. It is much more cost effective and efficient than renting individual vehicles from a national car rental company. Even with renting cars for each attendee, there is still the chance of them getting lost or not showing up to the events at all. Corporate mini coach transportation services simply make much more sense from a business point of view, as well as a financial one. Naturally, mini coach transportation will allow the executives to network, or brainstorm while traveling to the event venue. Luxury Transportation Group USA caters to companies in need of corporate mini coach transportation in Tampa. Luxury Transportation Group USA is the premiere provider of corporate mini coach transportation in Tampa. The professional drivers will ensure that the attendees get to and from the appropriate venues at the right times. Contact Luxury Transportation Group USA for quality transportation services in Tampa.